In this thread I will be posting various models from the Border Town Burning setting, which are not part of any particular warband. 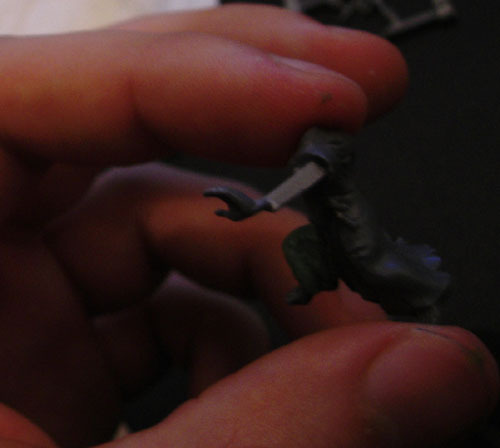 This includes Hired Swords, Dramatis Personae as well as monsters and other models from random encounters. I will also cite (some of) their fluff and background from the supplement for your reading pleasure. Although the populace of Sen’Quoi knows the name Ippan Shu, very few of them have ever seen him. Rumoured to be both a hundred years of age and a grand Master of the martial arts, he is also given supernatural aspects, such as the abilities of flight and the spitting of fire on those he calls foe. His legend says that a former disciple, Xiao Lin, once tried to assassinate him as Ippan Shu lay sleeping. Still asleep, he fought his student, only awakening when a knife sliced of half his left moustache (a grave outrage, for a Cathayan elder’s beard represents his wisdom and experience). Angered, Shu immediately killed Xiao Lin, yet still he keeps his moustache trimmed short; The better to remind him that even the best can be found wanting and caught off-guard, that no matter how good you become, you can always be better. A loner, Ippan Shu can be found wandering the Borderlands, meditating or fighting the different opponents that dwell therein, be they terrible creatures of Chaos or the ferocious hobgoblin wolf riders; he sees them all as a way of bettering his arts. Some whisper that Shu seeks to face an opponent who will prove a better fighter than he and, until that day, will continue his wanderings, whether he lives another hundred years or achieves enlightenment’s highest reaches. 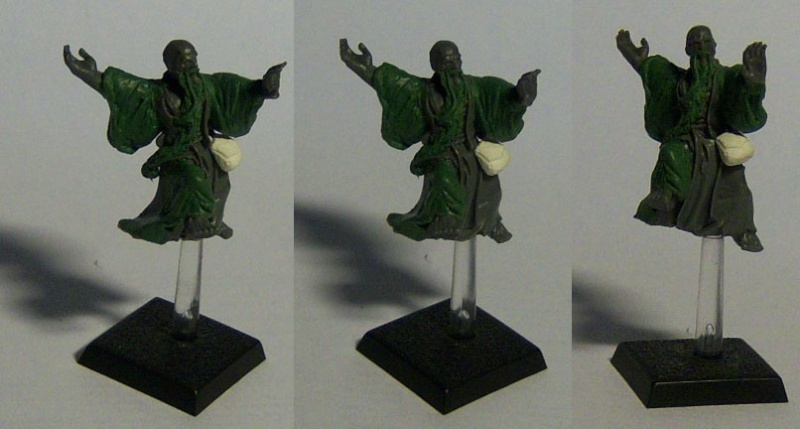 I made the model with bits from the Warhammer Empire flagellant box and lots of Green Stuff. Well done, Weed Hopper. Er.. sorry about the "Weed Hopper"I was having a Kung Fu moment there. A nice piece of sculpting; the postitioning is perfect, very Jet Li-ish, AND in the background of the last photo is The Tree. 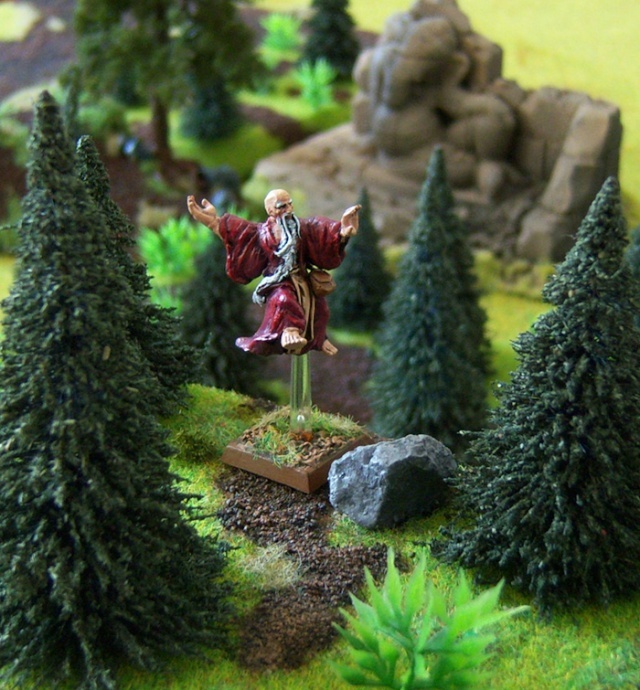 I love the photos of the Grand Master in his natural surroundings. Now what's this about smacking down my poor misunderstood Hobgoblin Wolf Riders? I love that one, nice work ! Why, that's quite apt. I mean, that's what the whole pose is all about: Weed hopping! Eastern movie style. He he, I'm not to blame for that. Rev is doing an awesome job on most of the fluff, background and story-telling for the BTB supplement. Let's face it, Hobgoblins are cool, but they don't make for great main characters. Wow. That came out great. I really like how he came together, and how the robe looks so real. Good job. Will there be more Dramatis Personi(ae) forth coming? I don't want to be a pest [likely story], but I DO live for your posts. Will there be more Dramatis Personi(ae) forth coming? 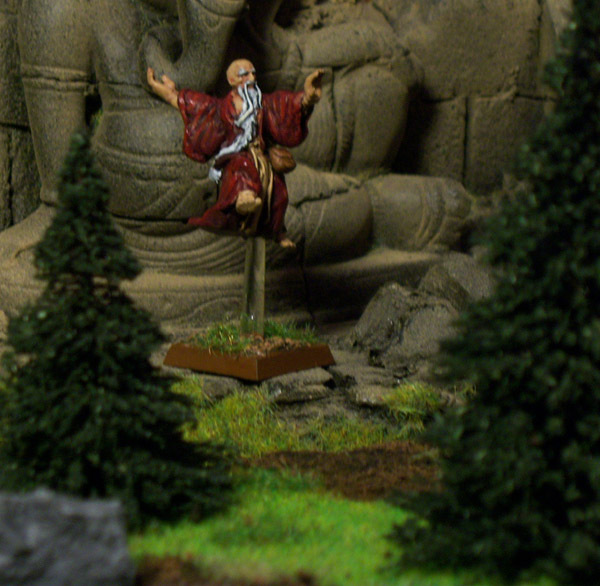 There are three Dramatis Personae total in BTB and the most important one, Belandysh, isn't properly represented as a miniature in my gaming group unfortunately. I don't think me or anyone else will find the time for a proper conversion as we have other things to do, so he's unlikely to appear. The last Dramatis pal is the Hobgoblin Khan I meantioned in the other thread. 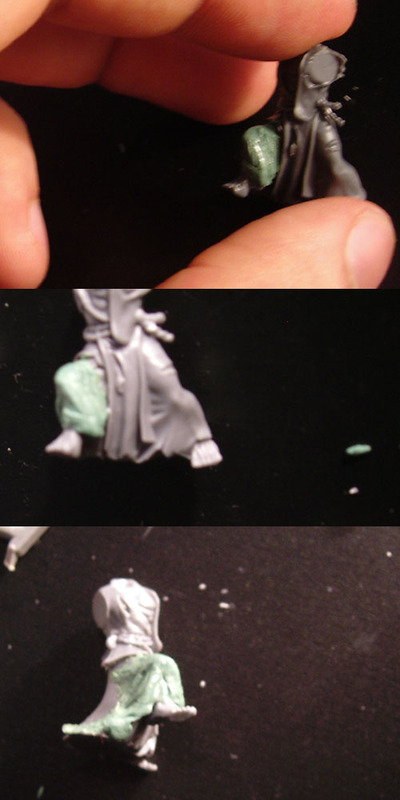 I do the Warhammer Dogs of War box for Oglah Khan but he is neither painted nor specifically converted (to boot I used his fur mantle for the Beastman banner - see the other thread). Cathay is well known for its spectacular fireworks. Beware of those who have the knowledge but not the mind to master these mesmerising displays of fire for visual effects alone. 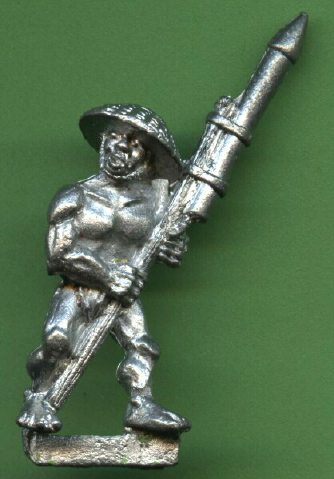 This crazed model is perfectly represented by some very old miniatures of the Nippon rocket crew, which could be found in the Warhammer 3rd edition hardback rulebook published in 1987. The miniature was pretty fine already so instead of altering it unnecessarily I made some markers for the rockets and fireworks that the Pyromaniac starts every turn. They fly across the battlefield in random directions each turn until they hit something so the markers are needed to represent their current position. 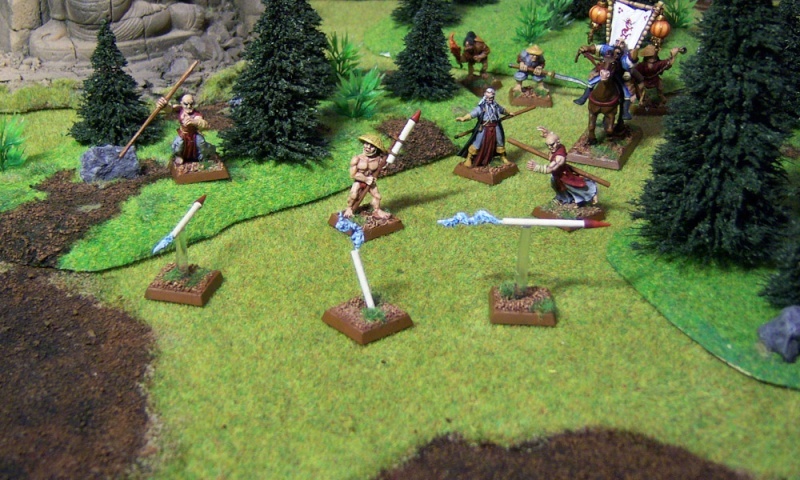 Below: A Cathayan Pyromaniac accompanies a Battle Monks warband into the battle. The crazed firestarter’s rockets may prove as a danger for not only the enemy. On a sidenote: 2,50 GBP for 4 minis AND a warmachine... my god, times have changed at GW. I'm really impressed by your imagination, with a great realisation (as always ). The rockets are perfect. In "reality" the Congreve rockets of the late 18th/early 19th century had the regretable habit of turning around & coming back at the firer; adds to the excitement of combat, eh?. I've got an old Grenadier Mongolish Rocket launcher & crew that may see a paint brush soon. Thanks for the push, Amigo. @Tom: when the rocket set came out it was one of GW's more pricey items. GW's prices have More than quintupled over the intervening years. The positive side of this is that smaller companies can charge similar amounts &, thereby, survive. Every cloud has a silver lining, but we, earth-bound creatures, still get rained on. Every cloud has a silver lining, but we, earth-bound creatures, still get rained on. That one will go in my quotation booklet, under "Deaf Nala - 2008"
Hahah Great Model + Rules. Definitely sounds fun. indeed, great work on the model! Belandysh was once a powerful Chaos Champion and Chieftain to the Tribe of the Rising Eagle, notable for their devotion to Chen, as Tchar is known amongst the Hung. When he turned from Chen’s paths, the Lord of Change blessed Belandysh in punishment, mutating the champion into a living symbol of constant change, gifting Belandysh a powerful blade that would deform his enemies into Chaos Spawn. Now he perfectly represents his former patron and can never be free, save in death. Perhaps that is the way the Master of Transfiguration meant for Belandysh to be after all. Belandysh is a mutating Champion of Tzeentch riding a mutating Chaos steed. He wields a Sword of Damnation and a helmet. I'll start painting it today, so it'll be completed till weekends. wow, l love it great job! Very nice piece of work. I look forward to the finished mini. That is one seriously intimidating dude; I think my Hobgoblin Raiders & Night Goblin Entrepeneurs will take a somewhat more Southerly route to Fabled Cathay. I love how you based his sword on the marker I did (with the hand and head). Awesome! I also dig his pose and chaotic mutating style. A great vision of the mighty Belandysh! Top job! I have ask you though: What is "battlemasters"? oops, i meant Battle Masters not Battlemasters. It featured chaos + orcs and goblins force vs. empire + brettonia force game. It was kinda Warhammer for beginners. I inserted Belandysh's background into your post, by the way. Now I'm looking foraward to seeing the painted model! My camera felt down from the table and it's LCD display is broken. 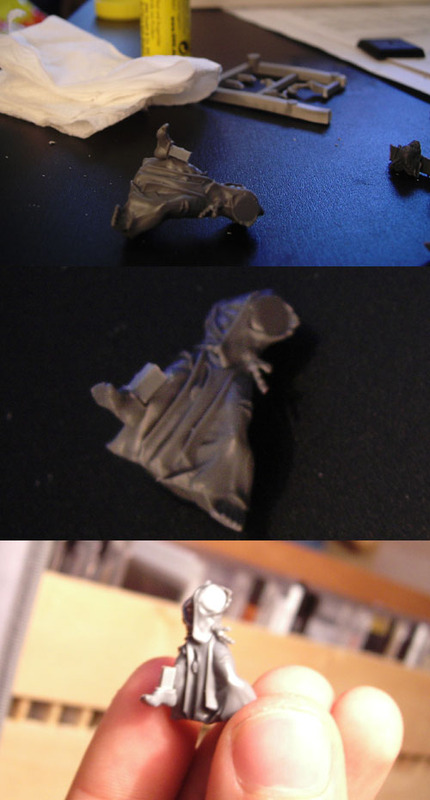 I painted Belandysh but i can't take better pictures of him 'till i'll make it repaired. Good paintjob lord Archaon. Solid stuff. I think you did the skin very well in particular. May I inquire why he is standing at the edge of his base rather than in the middle? Is that for better stacking because he normally is in a regiment? Thanks. I thought it would be a more dramatic pose for him. Looks really sweet, my Lord! I like the blue-yellow colour scheme. good work, the paintjob looks good!